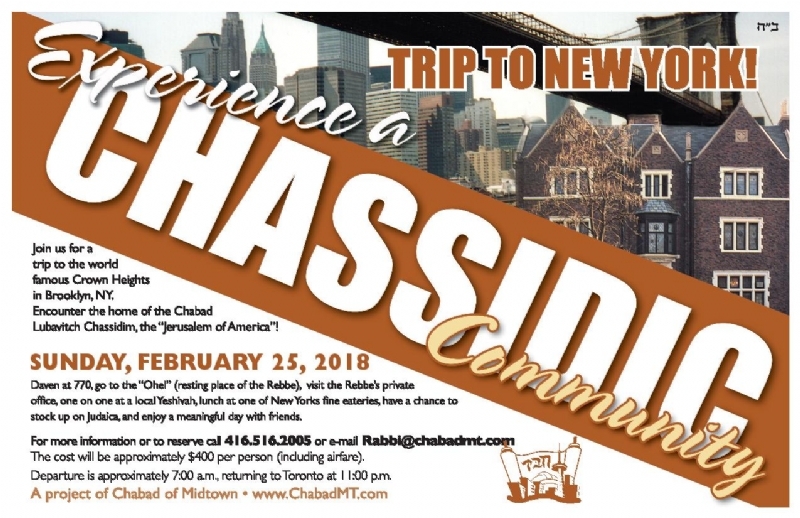 Encounter the home of the Chabad Lubavitch Chassidim, the "Jerusalem of America"! Daven at 770, go to the "Ohel" (resting place of the Rebbe ), tour the local matzah bakery, the extensive Library of Lubavitch (which includes many rare volumes and artifacts),have a chance to stock up on Judaica, and enjoy a meaningful day with friends. The cost will be approximately $400 per person (including airfare). Departure is approximately 7:00 a.m., returning to Toronto at 11:00 p.m.